I nearly finished my sequence diagram using astah community edition and figured out that I forgot one method call within the sequences. 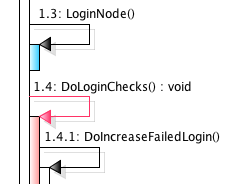 The message "LoginNode()" has to be "under" the message "DoLoginChecks()". Means: method "LoginNode()" will be called and in turn calls "DoLoginChecks()" so that "DoLoginChecks()" is a sub-method of "LoginNode()". This isn't the smartest way but the shortest step to achieve what you want to do. So this is how your Sequence diagram looks now. We added some colors to help you go with the step below little easier. 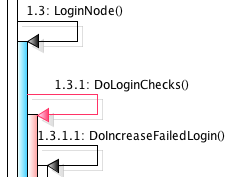 So now "LoginNode()" is under the message "DoLoginChecks()". Hope this helps. We apologize for too many steps. 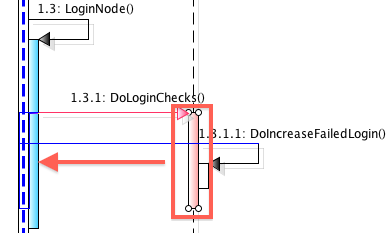 We'll improve to make it easier to edit existing Sequence diagrams in the future release.